Depart Dublin CityWe begin with an introduction to Dublin City after which we leave the city behind and head south towards the Wicklow Mountains. Meet your fellow travelers for a great trip to the "Garden of Ireland." 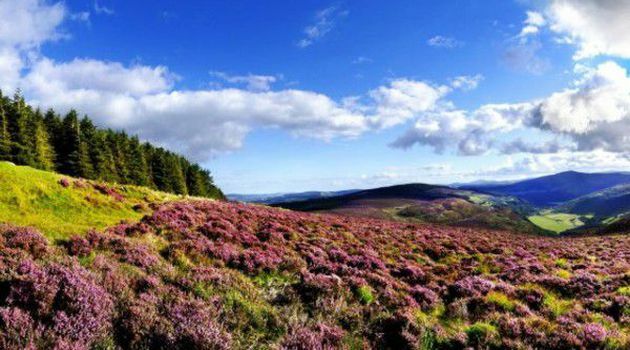 As we leave the city we pass by Sugar Loaf mountain and descend through Ireland's highest village Roundwood on your way to magnificent Glendalough. GlendaloughRenowned for its magnificent scenery and rich and varied heritage in terms of history and archaeology, Glendalough is famed for the Braveheart wedding scenes and it really is one of the most beautiful visitor sites in all of Ireland. You will have 1.5 hours to explore the deep valley with its ruined Monastic City of Celtic crosses, round towers and much more. Known as the valley of 2 lakes, we enjoy a leisurely stroll along the bank of the river, through the woods where we are greeted by babbling brooks, crystal cascades and the lakes of Glendalough. A real picture perfect moment. Travel through a real life movie setIf you are a fan of the Hollywood Blockbusters 'PS I Love You' and 'Braveheart' then join us on this tour! You will understand why Mel Gibson chose the Wicklow mountains to be the Highlands of Scotland and Glendalough to be the spot for the wedding scene. And then of course there are all the romantic scenes from 'PS I Love You', this is where Hilary Swank met Gerard Butler for the first time...you never know who you can meet! Wicklow mountainsWe return to Dublin, delighted with our wonderful half day tour and with great photos and memories to last a lifetime.